We’d love your help. Let us know what’s wrong with this preview of Going Scapegoat by David Buchanan. To ask other readers questions about Going Scapegoat, please sign up. "In its [combat gnosticism's] elitism, it prevents the moral burdens of war from being publicly shared. With every hajji I hear, every recycled Indian War stereotype I encounter, every traumatic tale of hero-wounding I read, I fear that we slide deeper into the comforting shade that the scapegoat provides. It's nice in the shade, though, so the vicarious redemption that the heroics of war afford is probably here to stay." 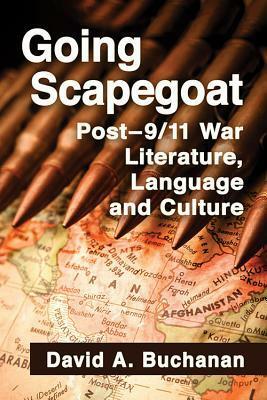 "Going Scapegoat" is a scholarly, theory-backed examination of recent American war literature and the culture surrounding the wars in Afghanistan, Iraq, and now Syria, and is such is not intended as a light read for the casual reader. Buchanan uses the theories of Kenneth Burke to provide a critical framework for his analysis of contemporary American war literature, and the result is a complex and theoretically informed discussion that takes on perhaps the biggest sacred cow of war writing--the primacy of firsthand experience--and highlights some of its problems. Namely, that this insistence on direct (infantry) combat experience is not only inappropriate for the type of modern warfare the US currently finds itself engaged in, where there often is no "front" as such and one can go on "combat" missions that involve no actual combat, only to fall prey to an IED or a stray shell in supposedly safe areas, but that it strengthens the military/civilian divide and allows civilians to disavow responsibility for the wars, scapegoating deployed servicemembers and laying the burden of war guilt on them, even as those doing the fighting scapegoat those whom they are fighting by using pejorative terms such as "hajji" and "sand nig" and using imagery from the US's conquest of the American native peoples. Buchanan brings up a number of slippery issues, such as the definition of a fobbit vs. a non-fobbit in his discussion of the book "FOBBIT," who are these hajjis anyway, and his own right to write this book--a pilot in the Air Force with multiple deployments to the Middle East, he tells us that he flew "roughly 1,200 'combat' hours between 2006 and 2010, and the whole time no hostile enemy ever threatened my airplane." So is he criticizing combat gnosticism from the inside, or the outside? Who gets to count as a "warrior," anyway? And in a democracy with a volunteer military, who bears the guilt for the wars that are being waged?